First off, I have to apologize, because we finished the benches and the bunks, but I haven’t taken any decent pictures of video of either. I’ll post them this weekend, and instructables for both interior construction and veggie conversion will appear sometime next weekend. So, I got a temporary registration from the DMV on Tuesday, and we decided we would take the bus for a short test drive up to Bar Harbor, ME. We packed enough stuff for a couple days, and set out, puttering along on veggie oil. Everything worked great, smelled great, and the veggie was transferring from the bulk to the day tank faster than ever. We’d never tried running the refinery after running the bus for a long time, but that heat really makes the difference. Mark and I set out from my house, and went to pick up the other two crew members who would be accompanying us on this quick trip. We grabbed Ali, and then Dan, and then set off for Cheney Tech to drop by and see Joe, and make a few last minute adjustments. Joe, Ali and Dan had a quick jam session in the back of the bus, and then we set off North, following bicycle directions, since the route would be a little more scenic. Driving on back roads proved to be really nice, but the routes weren’t very well marked and we had to default on the highway after we ended up making a huge circle. When we were well into Massachusetts, Mark was driving (and enjoying the hell out of it) when the engine suddenly lost power. Switching back to diesel still would not get the engine to fire, so we coasted off the next exit ramp and pulled over on the shoulder. 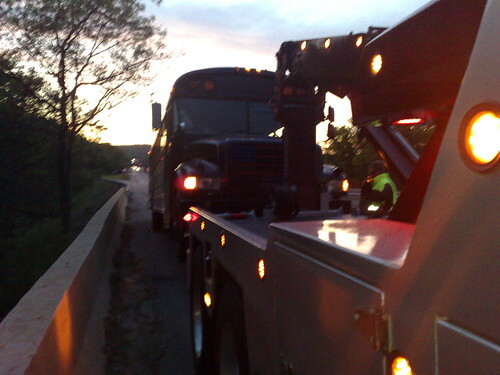 I should mention that this specific section we stopped on was on a bridge, and the bus took up the entire shoulder. We quickly figured out that the veggie fuel pump had failed, and we tried to get it started a few more times on diesel. No dice. We called AAA, and got a wrecker sent out to tow us somewhere where we could fiddle with the engine without getting slammed by oncoming traffic. After playing around with it for a little while, things seemed less and less hopeful. As it got darker and the engine cooled, the veggie oil left in the engine got thicker and thicker, and our odds of getting it started dropped dramatically. After nearly killing our battery, and trying to start with a jump from the wrecker, we threw in the towel. We were towed back to the garage, to await a tow to CT in the AM. After a few more unsuccessful tries, we left the batteries charging overnight. Ali and Dan met some really cool people on this trip, but most of my time was spent with the bus, so maybe they’ll be able to tell you about them. In the morning, Mark walked outside to check the batteries, and saw they were fully charged. “Let’s see what kind of day today will be,” and then he turned the key. It cranked for a little while, and just before he was about to let up we heard a spark of life in the engine. Hope renewed, we gave it a moment to cool down and charge up, and tried it again, reving it a little thing time. Slowly but surely, it started up, and after a good rev, the engine was clear and back on diesel. We drove the bus back to Cheney in the morning under its own power, and arrived just in time for morning announcements. This entry was posted in Build Log, the Tour and tagged breakdown, fuel pump. Bookmark the permalink. Great story; wish I could have been there with you guys. Just a note; I was talking to Lisa's dad again, who had participated in nearly every trade you can name. He was saying that his experience from driving diesel engines is that we're going to want to have a lot of back up filters on hand. He said that even on normal diesel engines that those cause a lot of trouble, and that it'll probably be worse with our nasty, unrefined slop. I know that wasn't the problem here, but it'd be nice if we have some ready to screw on if it becomes a problem in the middle of nowhere. Yes, he's right, and we do. Though we aren't _much_ worse than normal diesel, so it'll only be something we'll need to do every thousand miles or so.